With world-class ice climbing cliffs less than a fifteen-minute walk from the parking area this climbing course will maximize your time amidst the vertical. Our Introduction to Ice Climbing Course takes place on the flanks of the glacially carved Hyalite Canyon walls, situated on the northern fringe of the Greater Yellowstone Ecosystem. Our experienced ice climbing guides customize all ice climbing instruction to each individual’s climbing abilities and experience levels. Ice climbing technique is our focal point and you will be learning from the pros then put the climbing lessons in to action. Each day will be filled with continual feedback, instruction, and as much climbing as possible. Participants will walk away from our 2-day Introduction to Ice Climbing course with a solid ice climbing foundation; including the safety, knowledge, skills, and techniques needed to enjoy the wild and wonderful sport of ice climbing. Rappel setup and techniques with friction devices. The MAG ice guides are composed of some of the most experienced climbing guides in The Rockies with years of teaching and guiding in Hyalite Canyon and elsewhere. We love to pass our ice climbing knowledge on to new eager ice climbers. No experience is necessary for this course, which is why we are here! 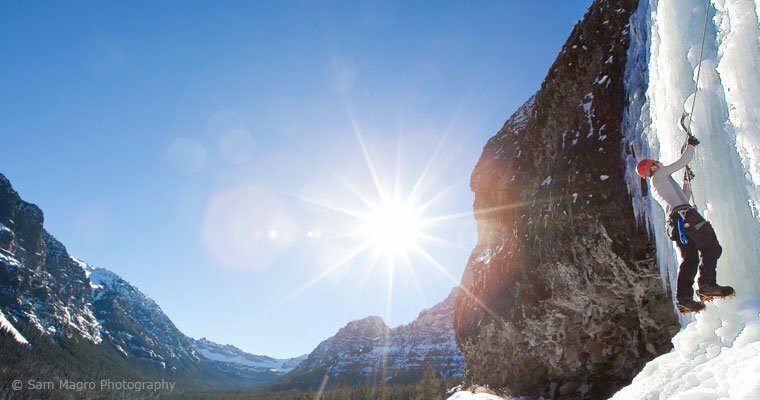 Hyalite Canyon is arguably the best ice climbing venue in the US. With its close proximity to Bozeman’s Gallatin Field International Airport, Hyalite Canyon is undoubtedly the most convenient and affordable world-class ice climbing venue to access in all of North America. In addition to this 2-day course you can maximize your time and expenses with one of our “Bonus Day Ice Climbs”. With a newly established skill set you will impress yourself at what you will be able to climb. Meet your guide at MAG’s shop, 13 Enterprise Blvd in Bozeman. Meet at MAG shop, carpool to Hyalite Canyon. Review skills from day 1. Climbing with instruction/coaching on steeper climbs. Return gear, debrief from trip, grab a MAG hoody or shirt. Put your new skills to use for a great day on a private guided climb. Available to those who have completed the course. On this day we head up to one of the multi-pitch (several rope lengths in height) climbs in Hyalite.